The Voice’s “Blind Auditions” for Season 7 on NBC are over and 48 talented singers have earned spots in the “Battle Rounds” and we have a full recap on their progress so far with a peek ahead ENJOY! “The Voice”, in it’s seventh season, has been graced with new super-star coaches Pharrell Williams and Gwen Stefani whose chairs were previously filled by Shakira and Usher during season six. Now that the first round – the Blind Auditions, of the show is over, coaches will be heading into the tougher part of the show, the Battle Rounds where they will be forced to cut team members, bringing their team numbers from 12 artists to 8. Originally first appearing on “The Voice” as Usher’s adviser in season four, Pharrell takes the place of Usher this season as a coach. Pharrell is a seven-time Grammy winning producer who during at least one of the Blind Auditions this season he stated bragging rights of working with such well-known artists as Robin Thicke and Justin Bieber. Pharrell said his style is to be “transparent” and to offer his services. Gwen said Pharrell is like a motivational speaker. During this season of Blind Auditions, Pharrell had to overcome competing with Gwen’s fashion bribes to contestants, Adam and Blake’s past ‘Voice trophies to win over artists. Blake said Pharrell gives Adam a run for his money and that Adam “does not know how to handle it.” Pharrell said his team is “speckled with unique talent that no one has seen before.” Blake thinks that Pharrell could possibly have the winner on his team. Team Pharrell Battle Rounds Sneak-Peek! Blake said he still loves the mystery of the Blind Auditions. 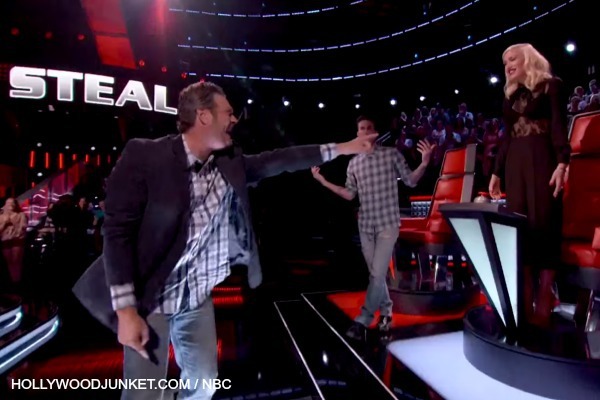 He said, “That moment when you decide to hit your button and you turn around and it’s not anything you thought it was going to be, but it’s the person you want to work with because they’re a great singer.” Gwen said “Blake makes you feel like you’re at home with him.” Blake has a lot of young people on his team this season. He said he excels in that area – of training young singers. Some of the youngest artists this season are on Team Blake. They are: Justin Johnes (age 15), Grant Ganzer (age 16) Tanner Linford (age 17), Reagan James (age 15), Kingston Moore (age 16), and 17 year old Fernandao Bosch. “Little Big Town” is Blake’s advisers this season. Some fans might be wondering why Blake put James David Carter against Craig Wayne Boyd. He said he only has room for one male country star on his team and he want to see which one will sing for their life. Gwen wants to take home her first win and be the first girl coach to win “The Voice”. Pharrell called her “the queen of awesomeness”. Gwen said everyone on her team has their own distinct sound already and she just plans to bring that out when she coaches them. Gwen’s adviser is her husband Gavin Rossdale from Bush. Adam said Team Adam is strong and diverse. “There’s challenges ahead” he said and he can’t wait to work with his team. Pharrell said Adam is a master-mind at what he does. Adam’s adviser this season is Stevie Nicks.